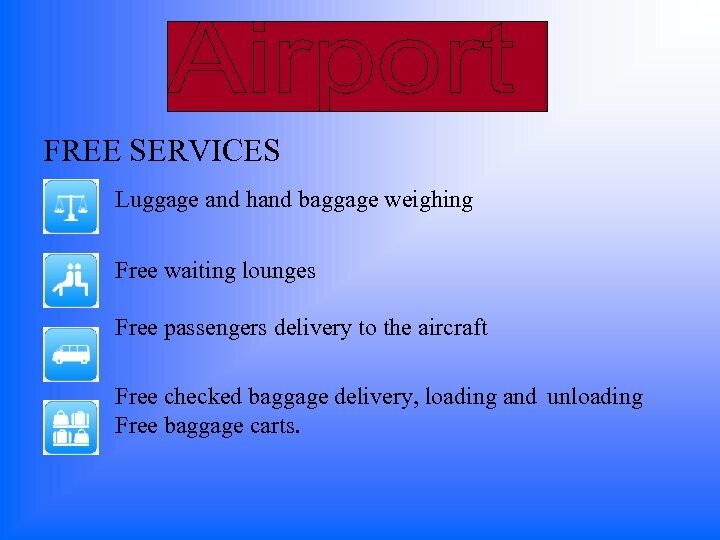 FREE SERVICES Luggage and hand baggage weighing Free waiting lounges Free passengers delivery to the aircraft Free checked baggage delivery, loading and unloading Free baggage carts. 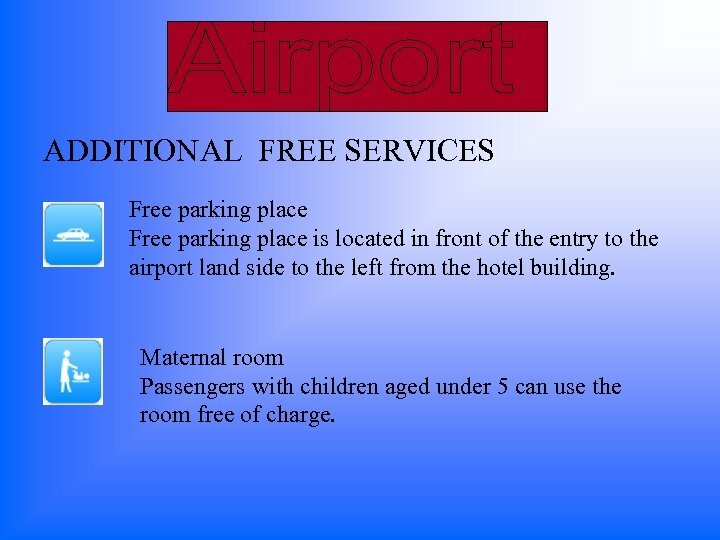 ADDITIONAL FREE SERVICES Free parking place is located in front of the entry to the airport land side to the left from the hotel building. Maternal room Passengers with children aged under 5 can use the room free of charge. 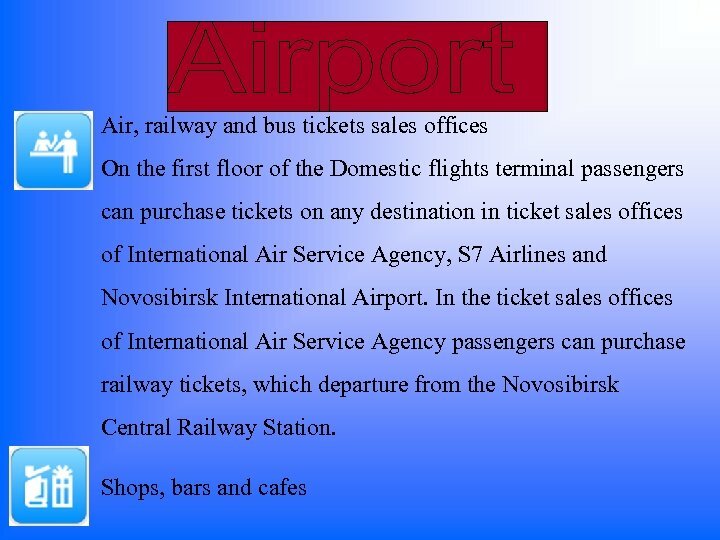 CHARGEABLE SERVICES Express bus connection between Tolmachevo airport and railway station Novosibirsk Glavny (Central station). Guarded parking place You can leave your car on the round the clock guarded parking place located in the opposite of the domestic flights terminal. The charge is 200 rubles for 24 hours. 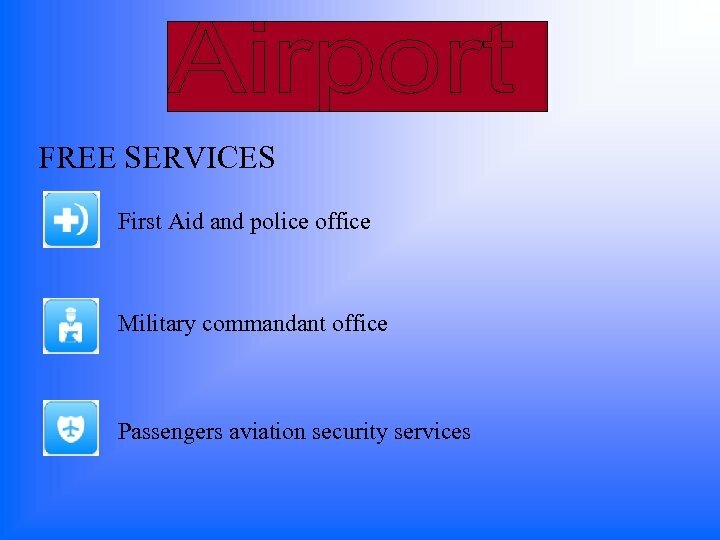 Post office On the second floor of the domestic flights terminal extension block you can use the services of post office and telegraph – send and receive a telegram, letter, money order, subscribe for the periodical press, make a phone call. Carrying of passenger’s luggage Performed by porters Luggage lockers room is located in the domestic flights terminal, arrival hall. The price is (for 24 hours): - Luggage sized up to 55*40*20 сm - 100 rubles; - Luggage sized over 55*40*20 см - 120 rubles; - Luggage sized over 100*50*70 см - 300 rubles; - Hand baggage - 70 rubles. VIP passengers service Luggage packing For the passenger comfort and better luggage safety passengers are offered to wrap up their luggage. Luggage wraping counters are located at the departure zones in Domestic flights and International terminals. 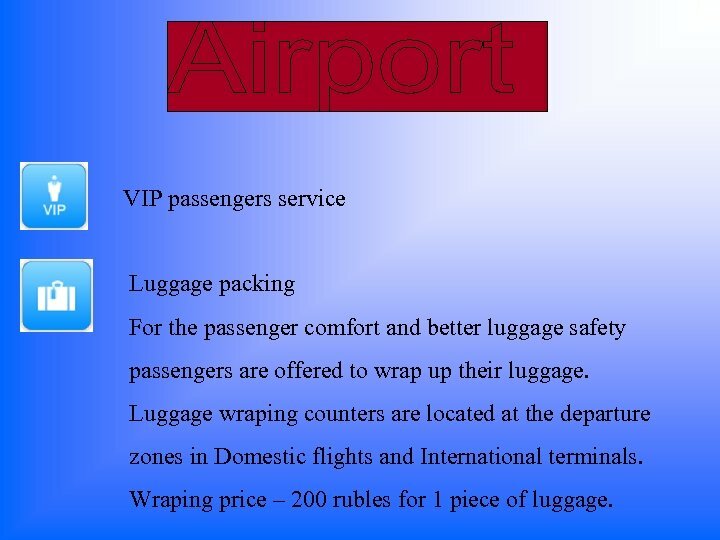 Wraping price – 200 rubles for 1 piece of luggage. 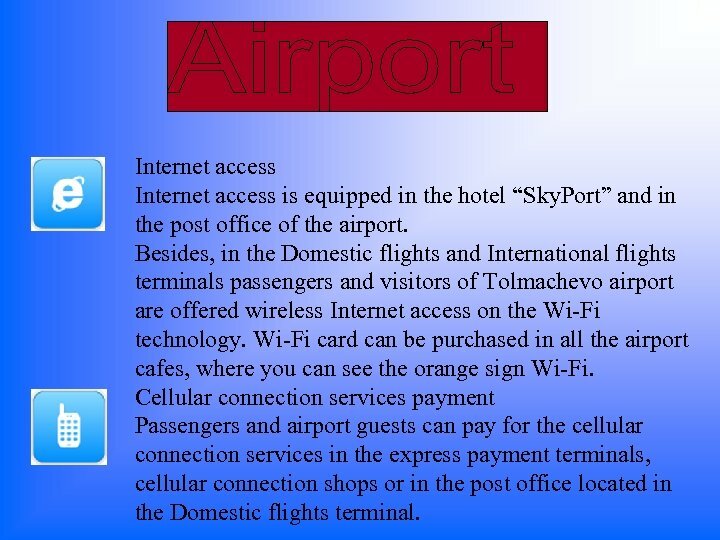 Internet access is equipped in the hotel “Sky. Port” and in the post office of the airport. 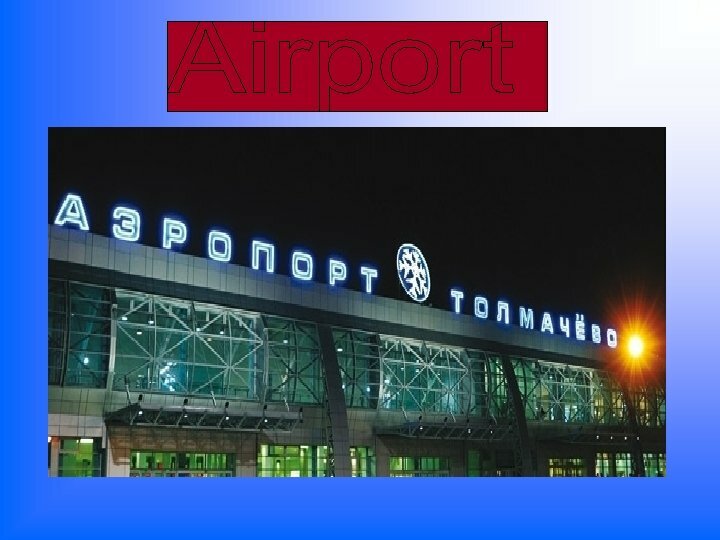 Besides, in the Domestic flights and International flights terminals passengers and visitors of Tolmachevo airport are offered wireless Internet access on the Wi-Fi technology. Wi-Fi card can be purchased in all the airport cafes, where you can see the orange sign Wi-Fi. Cellular connection services payment Passengers and airport guests can pay for the cellular connection services in the express payment terminals, cellular connection shops or in the post office located in the Domestic flights terminal. Shower For the long distance flight's passengers there are shower rooms with towels and toiletry. Price of this service is 100 rubles. Watch repair On the first floor of Domestic flights terminal there is a service for watch repair, quartz, electronic and mechanical watches preventive diagnostics, battery change, bracelets and wristlets repair. Café “Kardamon” Chaplygina st. 39 223 -03 -68 Perhaps it is the most popular place among creative youth. A small room decorated in ethnic style creates a comfortable atmosphere. 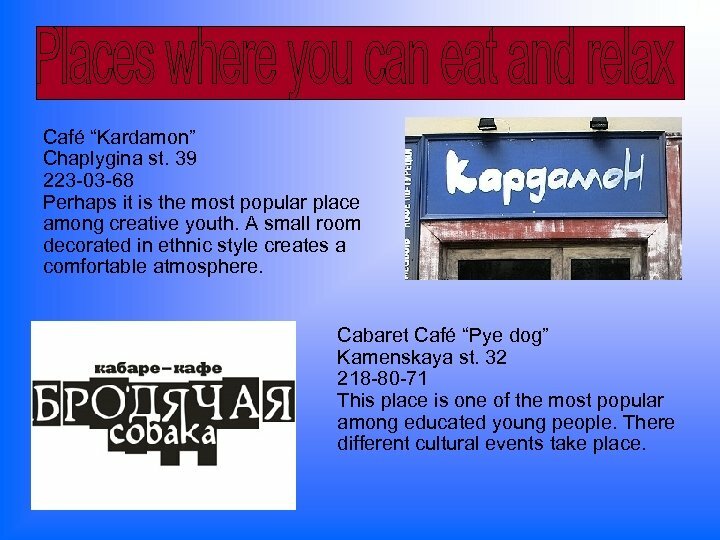 Cabaret Café “Pye dog” Kamenskaya st. 32 218 -80 -71 This place is one of the most popular among educated young people. There different cultural events take place. 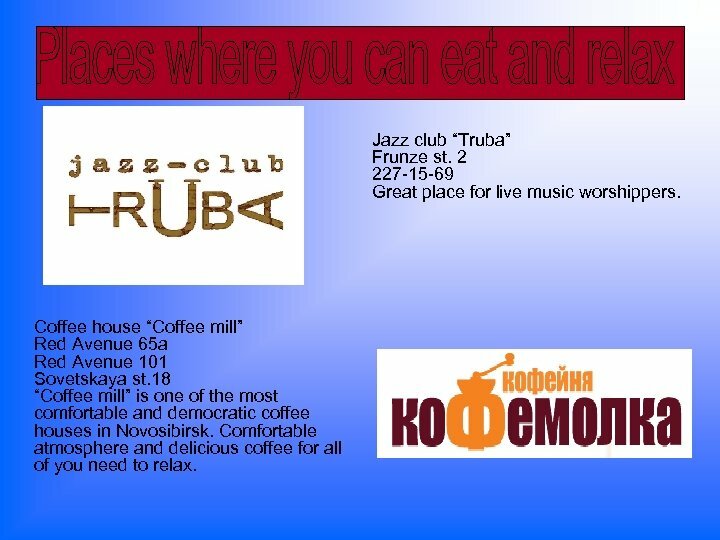 Jazz club “Truba” Frunze st. 2 227 -15 -69 Great place for live music worshippers. Coffee house “Coffee mill” Red Avenue 65 a Red Avenue 101 Sovetskaya st. 18 “Coffee mill” is one of the most comfortable and democratic coffee houses in Novosibirsk. Comfortable atmosphere and delicious coffee for all of you need to relax. Network of café “Traveler`s coffee” Red Avenue 17 Vatutina st. 107 Sovetskaya st. 18 Gorkogo st. 51 Nice music and varied menu pleasantly surprise you. 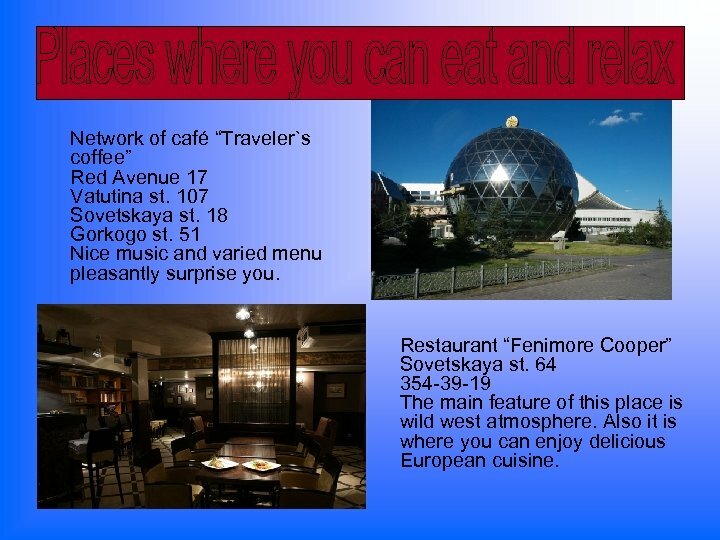 Restaurant “Fenimore Cooper” Sovetskaya st. 64 354 -39 -19 The main feature of this place is wild west atmosphere. Also it is where you can enjoy delicious European cuisine. 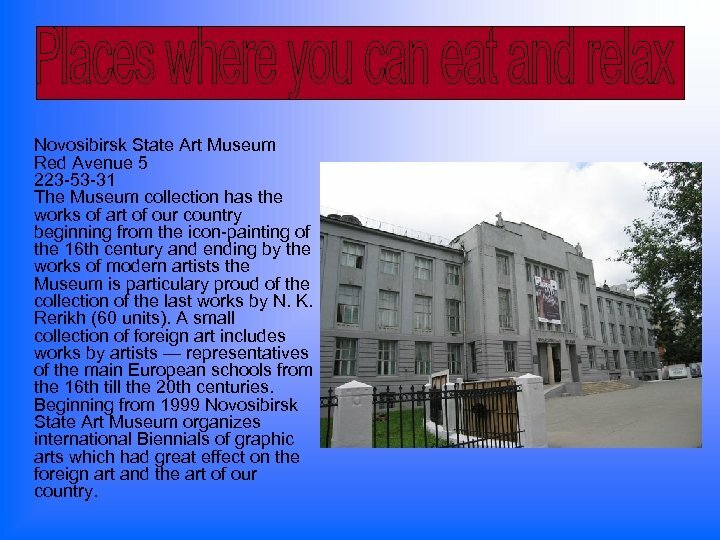 Novosibirsk State Art Museum Red Avenue 5 223 -53 -31 The Museum collection has the works of art of our country beginning from the icon-painting of the 16 th century and ending by the works of modern artists the Museum is particulary proud of the collection of the last works by N. K. Rerikh (60 units). A small collection of foreign art includes works by artists — representatives of the main European schools from the 16 th till the 20 th centuries. Beginning from 1999 Novosibirsk State Art Museum organizes international Biennials of graphic arts which had great effect on the foreign art and the art of our country. 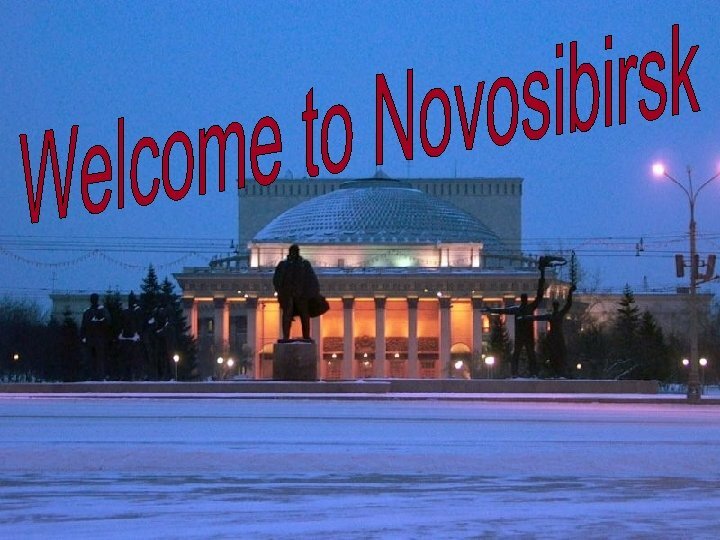 Novosibirsk State Academic Opera and Ballet Theatre Red Avenue 36 222 -60 -40 It is the most important theatre of Novosibirsk and Siberia. It is the largest theatre in Russia, even larger than the Bolshoi Theatre in Moscow. Located at the very center of the Novosibirsk city, at the Lenin square, it is the symbol of the city. 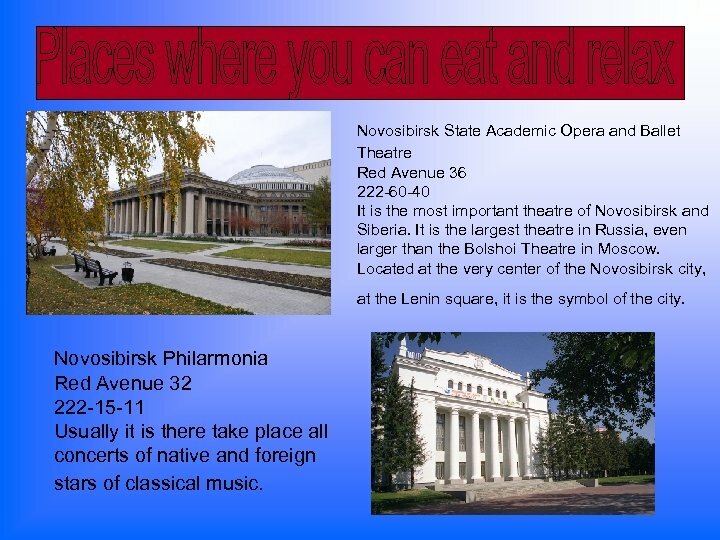 Novosibirsk Philarmonia Red Avenue 32 222 -15 -11 Usually it is there take place all concerts of native and foreign stars of classical music. There is a great number of health centers and local hospitals in Novosibirsk, in which qualified medical stuff works, in fact care about the health of townspeople - one of a distinctive features of Novosibirsk medicine. 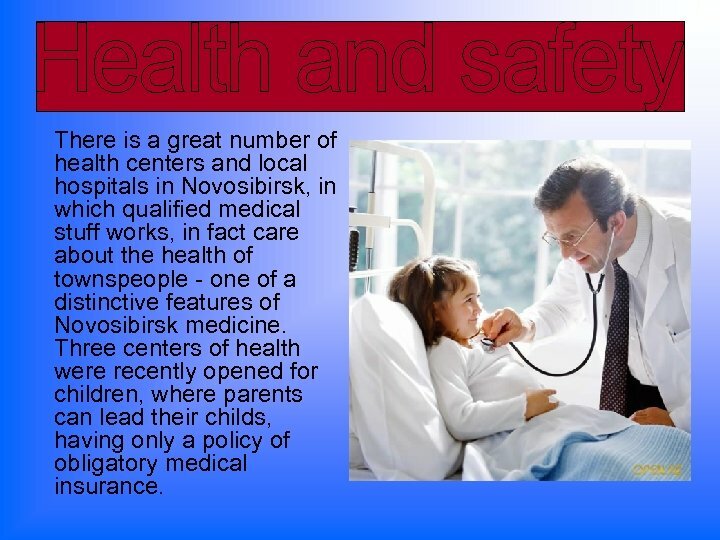 Three centers of health were recently opened for children, where parents can lead their childs, having only a policy of obligatory medical insurance. The centers of health for adults are called to realize a main task standing today before a health protection, - forming of healthy way of life, prophylaxis of morbidity, use of alcohol, tobacco and drugs. 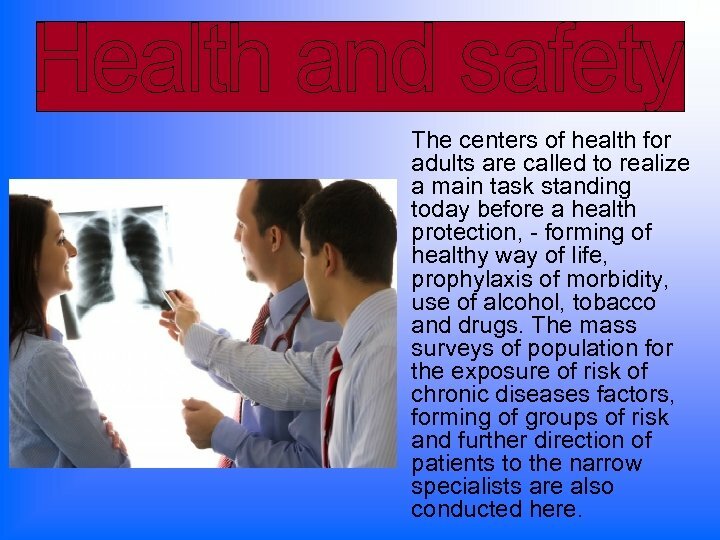 The mass surveys of population for the exposure of risk of chronic diseases factors, forming of groups of risk and further direction of patients to the narrow specialists are also conducted here. 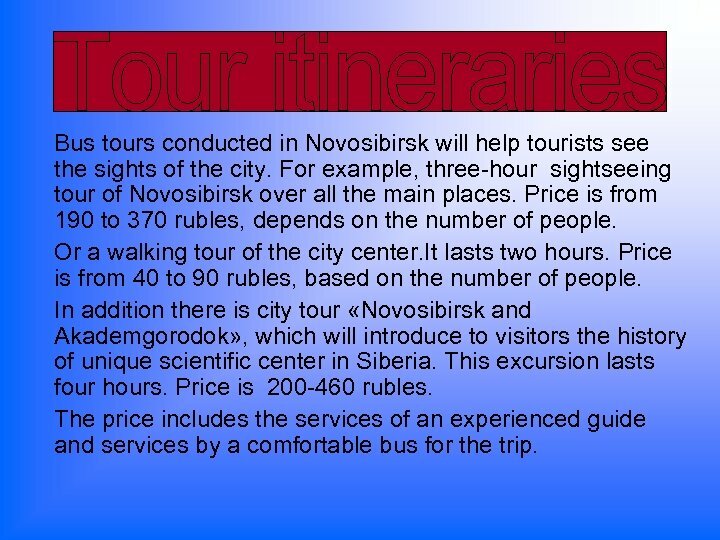 Bus tours conducted in Novosibirsk will help tourists see the sights of the city. 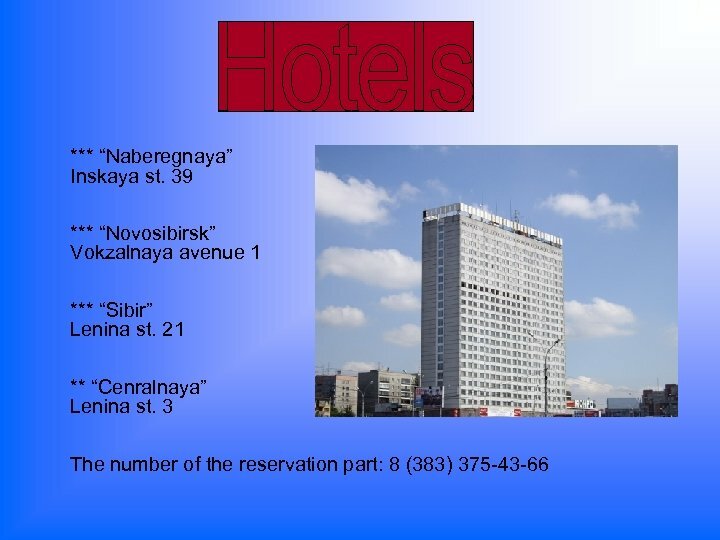 For example, three-hour sightseeing tour of Novosibirsk over all the main places. Price is from 190 to 370 rubles, depends on the number of people. Or a walking tour of the city center. It lasts two hours. Price is from 40 to 90 rubles, based on the number of people. In addition there is city tour «Novosibirsk and Akademgorodok» , which will introduce to visitors the history of unique scientific center in Siberia. This excursion lasts four hours. Price is 200 -460 rubles. The price includes the services of an experienced guide and services by a comfortable bus for the trip. 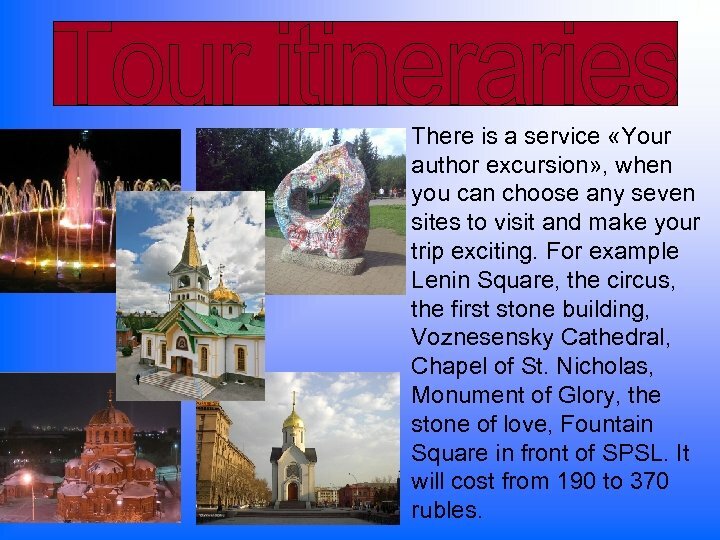 There is a service «Your author excursion» , when you can choose any seven sites to visit and make your trip exciting. 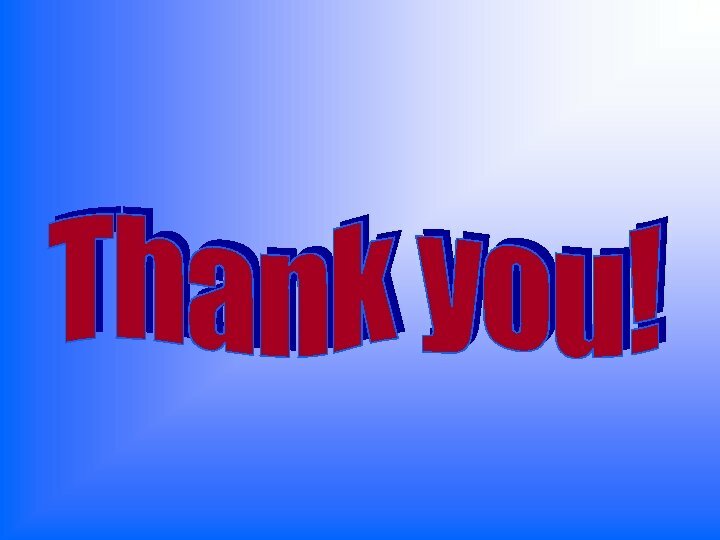 For example Lenin Square, the circus, the first stone building, Voznesensky Cathedral, Chapel of St. Nicholas, Monument of Glory, the stone of love, Fountain Square in front of SPSL. It will cost from 190 to 370 rubles. 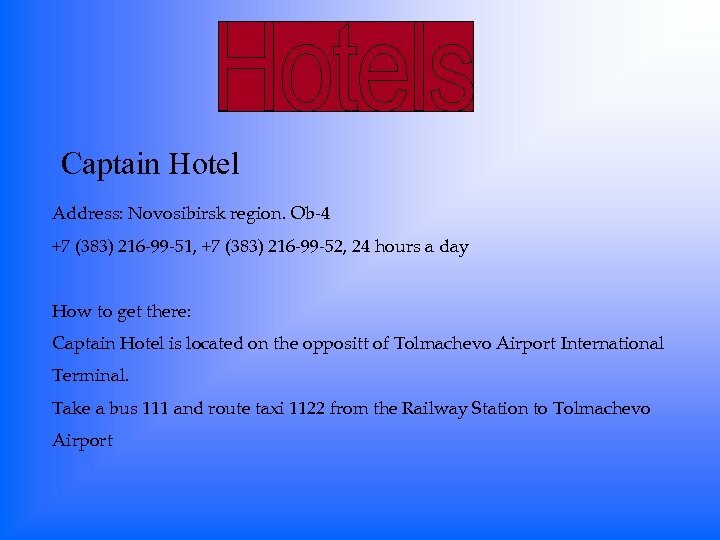 Interesting thematic tour is the "Rapid City ", City excursion - journey through time from the small village of Alexander to the third-largest city in Russia – Novosibirsk. 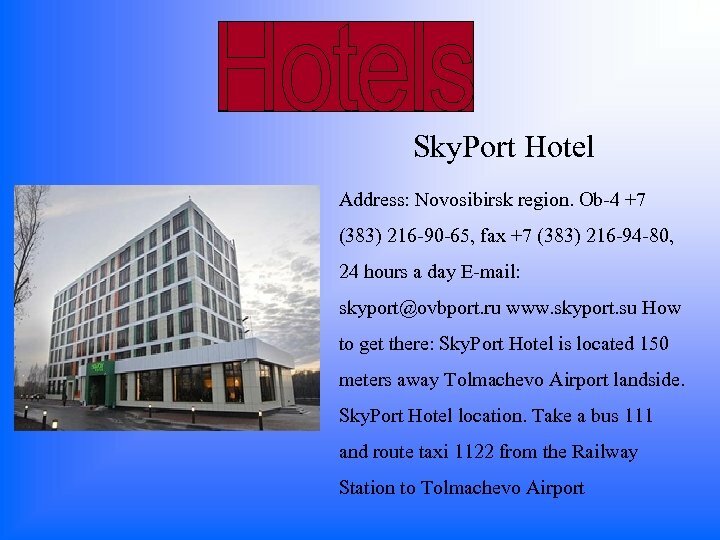 "The Lights of Novosibirsk» is sightseeing bus excursion through the city, visiting the attractions of Novosibirsk in the evening light lamps. 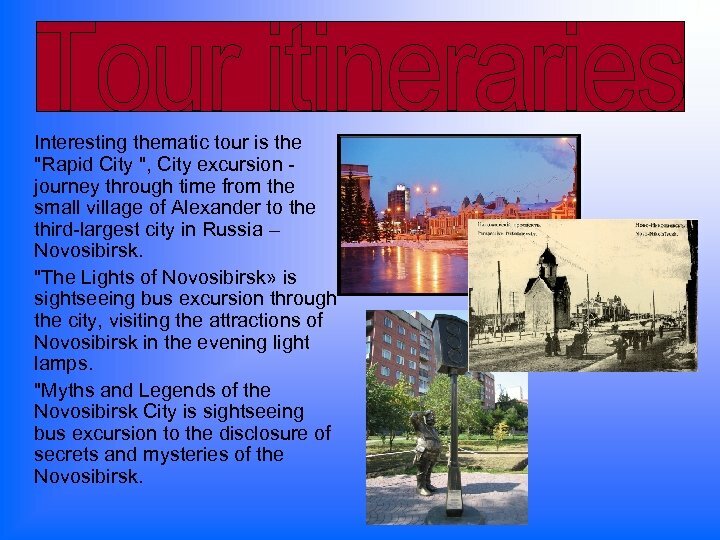 "Myths and Legends of the Novosibirsk City is sightseeing bus excursion to the disclosure of secrets and mysteries of the Novosibirsk.